All submissions need to be in English. Research-based submissions submitted to the JSPR for publication need to be original (i.e., not published/or submitted for publication elsewhere), provide a significant contribution to the field and be underpinned by a highly rigorous methodology. Please use the following list to check your submission before you submit it to the Journal for review. All submissions need to be in English and saved in Word format and then emailed as an attachment with a covering letter to the Editor, Journal of the Society for Psychical Research. All submitted manuscripts need to be Word format, size A4, with a top margin of 3.5cm, sides 3.3cm and bottom of 3.4cm. All text needs to be 12pt font Times Roman. Titles are often used in information-retrieval systems and as such, they should be concise and informative. In caps size 10pt, e.g., NAME OF AUTHOR. Please clearly indicate the given name(s) and family name(s) of each author. Provide each author’s affiliation address below the names. Clearly indicate who will handle all correspondence at all stages of the review process. The introduction states the topic and the main questions to be explored. The researchers supply background information by discussing past research on the topic. Extensive referencing establishes support for the discussion. The researchers explain how their study will add to past research on the topic. The researchers state their hypotheses. The results section summarises the data that was collected and the statistical analyses that were performed. The goal of this section is to report the results without any type of subjective interpretation. JSPR, consistent with APA recommendations, requires all data from inferential statistical analyses to include effect sizes so that readers can appreciate the importance of your study's findings. The discussion is given over to the interpretation of the results of the experiment, clearly stating whether the findings supported the hypothesis or not. It should also offer possible explanations for the findings and what they might mean in terms of future research on the topic. Showing mean (and standard deviation) ESP and Baseline scores for the positive images, negative images and for all images combined. Corresponding Authors are responsible for securing any/all written permission to reproduce any previously published or unpublished material for which copyright is currently held. If it is necessary to include one or more images in the manuscript each image must be saved in a digital format at a minimum resolution of 300 dpi. Each image then needs to be sent as a separate file along with the submitted manuscript. Please ensure that every reference cited in the text is also present in the reference list (and vice versa). Any references cited in the abstract must be given in full. Unpublished results and personal communications are not recommended in the reference list, but may be mentioned in the text. If these references are included in the reference list they should follow the standard reference style of the journal (i.e., APA) and should include a substitution of the publication date with either 'Unpublished results' or 'Personal communication'. Citation of a reference as 'in press' implies that the item has been accepted for publication. All references in the text should follow the referencing style used by the American Psychological Association. You are referred to the Publication Manual of the American Psychological Association, Sixth Edition, ISBN 978-1-4338-0561-5, copies of which may be ordered online or from APA Order Dept., P.O.B. 2710, Hyattsville, MD 20784, USA or APA, 3 Henrietta Street, London, WC3E 8LU, UK. High levels of belief in psi is primarily associated with high levels of intelligence (Clark, 2011). According to Clark (2011) high levels of belief in psi is primarily associated with high levels of intelligence. Precognition is less likely to emerge when being assessed using a slow explicit based task (Smith & Jones, 2018). 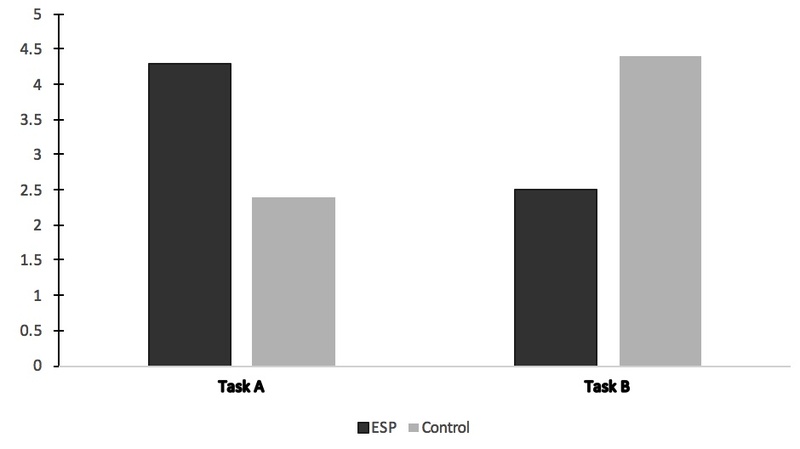 Smith and Jones (2018) found that precognition was less likely to emerge when being assessed using a slow explicit based task. Precognition is less likely to emerge when being assessed using a slow explicit based task (Smith, Jones & Brown, 2018). Smith, Jones and Brown (2018) found that precognition was less likely to emerge when being assessed using a slow explicit based task. Precognition is less likely to emerge when being assessed using a slow explicit based task (Smith et al., 2018). Smith et al. (2018) found that precognition was less likely to emerge when being assessed using a slow explicit based task. Strunk, W., & White, E. B. (2000). The elements of style. (4th ed.). New York: Longman, (Chapter 4). Cancer Research UK. Cancer statistics reports for the UK. (2003). http://<insert URL here> Accessed 13 March 2003. A brief guide to APA referencing style along with frequently asked questions can be found here.